This 5Rhythms workshop will be centered around deepening our relationship to what Gabrielle Roth saw as the essential & first building block of her work, the rhythm of Flowing. Flowing, as it sounds, is rounded, continuous, curvaceous, unpredictable and feminine in nature. Connected to the element of earth, flowing is the grounding rhythm. We begin in the here and now with ourselves as we are and take the time to check in. How does the body feel? How does the heart feel? What do we sense around us and can we be receptive to the messages? How can we mother ourselves, and nurture the spirit within? We let the answers appear through movement, allowing the dance to reveal the pathway in. Flowing asks us to enjoy the embodiment of our own weight in motion. The play between gravity and movement, the curve between our roots & our momentum. The gateway to flowing is through our feet. Learning to listen and connect to our feet, our earth, our ground, helps us to trust our inner wisdom, our intuition. 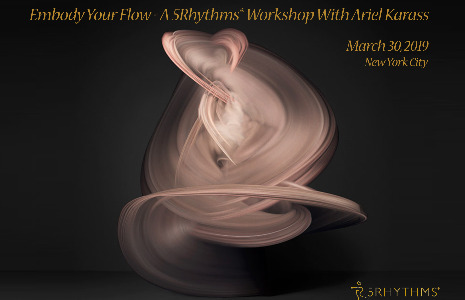 This workshop is an invitation to explore, play, learn, discover and expand awareness around the magic of Flow, and how to connect to flow within the other 4 rhythms of the 5 rhythms practice. All are welcome to participate in this workshop. No experience necessary to join. This workshop will count as one day Waves towards teacher training pre-requisites. For a full refund minus a $50 processing fee, you must cancel at least 4 weeks in advance of this workshop. For a full refund minus a 50% processing fee you must cancel at least 2 weeks in advance of this workshop. Within 2 weeks of this workshop all refunds will be subject to participant replacement. If you do not show up for the workshop without communicating and we were unable to fill your spot, your money will not be refunded. Due to limited space, in the event that a waiting list is necessary, only fully paid registrations will take priority. We will contact you directly if you have not paid in full and we have less than ten spots left. A full refund of the tuition fee received from a participant will be made. The organizers will hold no financial responsibility for the participants travel expenses. Every attempt will be made to give as much prior warning of cancellation as possible.